Thanks for your interest in guided Colorado Black Bear Hunts with Jackson Outfitters! We are dedicated to providing fully guided, quality black bear hunts with our seasoned, professional guides. Please read our Bear Hunting Information below. If you would like to arrange a hunt for you or your group, feel free to give us a call today. We look forward to speaking with you! 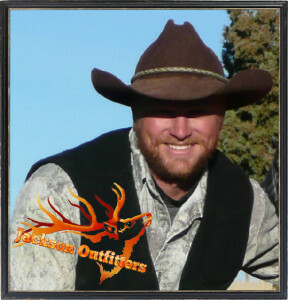 Jackson outfitters provides archery, muzzle loading and rifle Colorado Black Bear Hunts in Colorado. Game management units 411, 521, 52, 53, and 63 have a large amount of scrub oak, serviceberry and choke cherry vegetation. This vegetation is very dense thick cover and produces acorns and berries that the bears love. Due to this there is a very good bear population in these units. Our Trophy Black Bear Hunts are offered during the month of September. At this time of the year the bears are spending more and more time each day gorging themselves on berries and acorns. During this season we will do a lot of glassing to locate bears as they forage. We see a wide range of colored black bears, everything from black to cinnamon, and in more recent years, lighter blonde colored bears have been spotted as well. The average bear will be 250 lbs, though we see bears each year up to the 500 lb range. Our bear hunts are $3500 per person 5 day hunts one on one fully guided. If you are interested in more information about our Colorado Black Bear Hunts, or would like to Book a Black Bear Hunt with Jackson Outfitters, contact Roy Jackson today!